This FREE conference is run by volunteers and open to everyone. 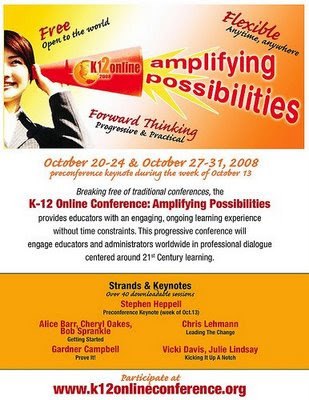 The 2008 conference theme is Amplifying Possibilities. This year’s conference begins with a pre-conference keynote the week of October 13, 2008. The following two weeks, October 20-24 and October 27-31, forty presentations will be posted online to the conference blog for participants to download and view.